Proprietary Name: Carbamazepine What is the Proprietary Name? Non-Proprietary Name: Carbamazepine What is the Non-Proprietary Name? 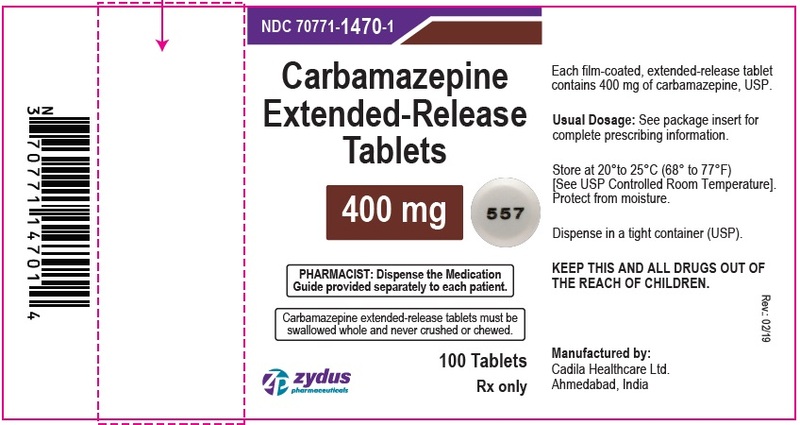 Carbamazepine with NDC 70771-1468 is a a human prescription drug product labeled by Cadila Healthcare Limited. The generic name of Carbamazepine is carbamazepine. The product's dosage form is tablet, extended release and is administered via oral form. FDA Application Number: ANDA205571 What is the FDA Application Number? SERIOUS DERMATOLOGIC REACTIONS AND HLA-B*1502 ALLELESERIOUS AND SOMETIMES FATAL DERMATOLOGIC REACTIONS, INCLUDING TOXIC EPIDERMAL NECROLYSIS (TEN) AND STEVENS-JOHNSON SYNDROME (SJS), HAVE BEEN REPORTED DURING TREATMENT WITH CARBAMAZEPINE. THESE REACTIONS ARE ESTIMATED TO OCCUR IN 1 TO 6 PER 10,000 NEW USERS IN COUNTRIES WITH MAINLY CAUCASIAN POPULATIONS, BUT THE RISK IN SOME ASIAN COUNTRIES IS ESTIMATED TO BE ABOUT 10 TIMES HIGHER. STUDIES IN PATIENTS OF CHINESE ANCESTRY HAVE FOUND A STRONG ASSOCIATION BETWEEN THE RISK OF DEVELOPING SJS/TEN AND THE PRESENCE OF HLA-B*1502, AN INHERITED ALLELIC VARIANT OF THE HLA-B GENE. HLA-B*1502 IS FOUND ALMOST EXCLUSIVELY IN PATIENTS WITH ANCESTRY ACROSS BROAD AREAS OF ASIA. PATIENTS WITH ANCESTRY IN GENETICALLY AT-RISK POPULATIONS SHOULD BE SCREENED FOR THE PRESENCE OF HLA-B*1502 PRIOR TO INITIATING TREATMENT WITH CARBAMAZEPINE. PATIENTS TESTING POSITIVE FOR THE ALLELE SHOULD NOT BE TREATED WITH CARBAMAZEPINE UNLESS THE BENEFIT CLEARLY OUTWEIGHS THE RISK (SEE WARNINGS AND PRECAUTIONS, LABORATORY TESTS).APLASTIC ANEMIA AND AGRANULOCYTOSISAPLASTIC ANEMIA AND AGRANULOCYTOSIS HAVE BEEN REPORTED IN ASSOCIATION WITH THE USE OF CARBAMAZEPINE. DATA FROM A POPULATION-BASED CASE CONTROL STUDY DEMONSTRATE THAT THE RISK OF DEVELOPING THESE REACTIONS IS 5 TO 8 TIMES GREATER THAN IN THE GENERAL POPULATION. HOWEVER, THE OVERALL RISK OF THESE REACTIONS IN THE UNTREATED GENERAL POPULATION IS LOW, APPROXIMATELY SIX PATIENTS PER ONE MILLION POPULATION PER YEAR FOR AGRANULOCYTOSIS AND TWO PATIENTS PER ONE MILLION POPULATION PER YEAR FOR APLASTIC ANEMIA.ALTHOUGH REPORTS OF TRANSIENT OR PERSISTENT DECREASED PLATELET OR WHITE BLOOD CELL COUNTS ARE NOT UNCOMMON IN ASSOCIATION WITH THE USE OF CARBAMAZEPINE, DATA ARE NOT AVAILABLE TO ESTIMATE ACCURATELY THEIR INCIDENCE OR OUTCOME. HOWEVER, THE VAST MAJORITY OF THE CASES OF LEUKOPENIA HAVE NOT PROGRESSED TO THE MORE SERIOUS CONDITIONS OF APLASTIC ANEMIA OR AGRANULOCYTOSIS.BECAUSE OF THE VERY LOW INCIDENCE OF AGRANULOCYTOSIS AND APLASTIC ANEMIA, THE VAST MAJORITY OF MINOR HEMATOLOGIC CHANGES OBSERVED IN MONITORING OF PATIENTS ON CARBAMAZEPINE ARE UNLIKELY TO SIGNAL THE OCCURRENCE OF EITHER ABNORMALITY. NONETHELESS, COMPLETE PRETREATMENT HEMATOLOGICAL TESTING SHOULD BE OBTAINED AS A BASELINE. IF A PATIENT IN THE COURSE OF TREATMENT EXHIBITS LOW OR DECREASED WHITE BLOOD CELL OR PLATELET COUNTS, THE PATIENT SHOULD BE MONITORED CLOSELY. DISCONTINUATION OF THE DRUG SHOULD BE CONSIDERED IF ANY EVIDENCE OF SIGNIFICANT BONE MARROW DEPRESSION DEVELOPS. Carbamazepine USP, is an anticonvulsant and specific analgesic for trigeminal neuralgia, available for oral administration as extended-release tablets of 100, 200, and 400 mg. Its chemical name is 5H-dibenz[b,f ]azepine-5-carboxamide, and its structural formula is:Carbamazepine USP is a white to off-white odourless crystalline powder, sparingly soluble in acetone and in ethanol (96%), very slightly soluble in water. Its molecular weight is 236.27.Each carbamazepine extended-release tablet intended for oral administration contains 100 mg, 200 mg and 400 mg of carbamazepine. In addition, each tablet contains the following inactive ingredients: cellulose acetate, dextrates, hydroxyethyl cellulose, hypromellose, magnesium stearate, mannitol, polyethylene glycol and sodium lauryl sulfate. Each tablet is printed with opacode black S-1-17823 ink which contains ammonium hydroxide, iron oxide black, isopropyl alcohol, n-butyl alcohol, propylene glycol and shellac.USP Dissolution Test pending. Carbamazepine has demonstrated anticonvulsant properties in rats and mice with electrically and chemically induced seizures. It appears to act by reducing polysynaptic responses and blocking the post-tetanic potentiation. Carbamazepine greatly reduces or abolishes pain induced by stimulation of the infraorbital nerve in cats and rats. It depresses thalamic potential and bulbar and polysynaptic reflexes, including the linguomandibular reflex in cats. Carbamazepine is chemically unrelated to other anticonvulsants or other drugs used to control the pain of trigeminal neuralgia. The mechanism of action remains unknown.The principal metabolite of carbamazepine, carbamazepine-10,11-epoxide, has anticonvulsant activity as demonstrated in several in vivo animal models of seizures. Though clinical activity for the epoxide has been postulated, the significance of its activity with respect to the safety and efficacy of carbamazepine has not been established. In clinical studies, carbamazepine suspension, conventional tablets, and extended-release tablets delivered equivalent amounts of drug to the systemic circulation. However, the suspension was absorbed somewhat faster, and the extended-release tablet slightly slower, than the conventional tablet. The bioavailability of the extended-release tablet was 89% compared to suspension. Following a twice a day dosage regimen, the suspension provides higher peak levels and lower trough levels than those obtained from the conventional tablet for the same dosage regimen. On the other hand, following a three times a day dosage regimen, carbamazepine suspension affords steady-state plasma levels comparable to carbamazepine tablets given twice a day when administered at the same total mg daily dose. Following a twice a day dosage regimen, carbamazepine extended-release tablets afford steady-state plasma levels comparable to conventional carbamazepine tablets given four times a day, when administered at the same total mg daily dose. Carbamazepine in blood is 76% bound to plasma proteins. Plasma levels of carbamazepine are variable and may range from 0.5 mcg/mL to 25 mcg/mL, with no apparent relationship to the daily intake of the drug. Usual adult therapeutic levels are between 4 mcg/mL and 12 mcg/mL. In polytherapy, the concentration of carbamazepine and concomitant drugs may be increased or decreased during therapy, and drug effects may be altered (see PRECAUTIONS, Drug Interactions). Following chronic oral administration of suspension, plasma levels peak at approximately 1.5 hours compared to 4 to 5 hours after administration of conventional carbamazepine tablets, and 3 to 12 hours after administration of carbamazepine extended-release tablets. The CSF/serum ratio is 0.22, similar to the 24% unbound carbamazepine in serum. Because carbamazepine induces its own metabolism, the half-life is also variable. Autoinduction is completed after 3 to 5 weeks of a fixed dosing regimen. Initial half-life values range from 25 to 65 hours, decreasing to 12 to 17 hours on repeated doses. Carbamazepine is metabolized in the liver. Cytochrome P450 3A4 was identified as the major isoform responsible for the formation of carbamazepine-10,11-epoxide from carbamazepine. Human microsomal epoxide hydrolase has been identified as the enzyme responsible for the formation of the 10,11-transdiol derivative from carbamazepine-10,11 epoxide. After oral administration of 14C-carbamazepine, 72% of the administered radioactivity was found in the urine and 28% in the feces. This urinary radioactivity was composed largely of hydroxylated and conjugated metabolites, with only 3% of unchanged carbamazepine.The pharmacokinetic parameters of carbamazepine disposition are similar in children and in adults. However, there is a poor correlation between plasma concentrations of carbamazepine and carbamazepine dose in children. Carbamazepine is more rapidly metabolized to carbamazepine-10,11-epoxide (a metabolite shown to be equipotent to carbamazepine as an anticonvulsant in animal screens) in the younger age groups than in adults. In children below the age of 15, there is an inverse relationship between CBZ-E/CBZ ratio and increasing age (in one report from 0.44 in children below the age of 1 year to 0.18 in children between 10 to 15 years of age).The effects of race and gender on carbamazepine pharmacokinetics have not been systematically evaluated. Carbamazepine extended-release tablets are indicated for use as an anticonvulsant drug. Evidence supporting efficacy of carbamazepine extended-release tablets as an anticonvulsant was derived from active drug-controlled studies that enrolled patients with the following seizure types:Partial seizures with complex symptomatology (psychomotor, temporal lobe). Patients with these seizures appear to show greater improvement than those with other types. Generalized tonic-clonic seizures (grand mal). Mixed seizure patterns which include the above, or other partial or generalized seizures. Absence seizures (petit mal) do not appear to be controlled by carbamazepine extended-release tablets (see PRECAUTIONS, General). Carbamazepine extended-release tablets are indicated in the treatment of the pain associated with true trigeminal neuralgia.Beneficial results have also been reported in glossopharyngeal neuralgia.This drug is not a simple analgesic and should not be used for the relief of trivial aches or pains. Carbamazepine should not be used in patients with a history of previous bone marrow depression, hypersensitivity to the drug, or known sensitivity to any of the tricyclic compounds, such as amitriptyline, desipramine, imipramine, protriptyline, nortriptyline, etc. Likewise, on theoretical grounds its use with monoamine oxidase (MAO) inhibitors is not recommended. Before administration of carbamazepine, MAO inhibitors should be discontinued for a minimum of 14 days, or longer if the clinical situation permits.Coadministration of carbamazepine and nefazodone may result in insufficient plasma concentrations of nefazodone and its active metabolite to achieve a therapeutic effect. Coadministration of carbamazepine with nefazodone is contraindicated. Retrospective case-control studies have found that in patients of Chinese ancestry there is a strong association between the risk of developing SJS/TEN with carbamazepine treatment and the presence of an inherited variant of the HLA-B gene, HLA-B*1502. The occurrence of higher rates of these reactions in countries with higher frequencies of this allele suggests that the risk may be increased in allele-positive individuals of any ethnicity.Across Asian populations, notable variation exists in the prevalence of HLA-B*1502. Greater than 15% of the population is reported positive in Hong Kong, Thailand, Malaysia, and parts of the Philippines, compared to about 10% in Taiwan and 4% in North China. South Asians, including Indians, appear to have intermediate prevalence of HLA-B*1502, averaging 2% to 4%, but higher in some groups. HLA-B*1502 is present in less than 1% of the population in Japan and Korea.HLA-B*1502 is largely absent in individuals not of Asian origin (e.g., Caucasians, African-Americans, Hispanics and Native Americans).Prior to initiating carbamazepine therapy, testing for HLA-B*1502 should be performed in patients with ancestry in populations in which HLA-B*1502 may be present. In deciding which patients to screen, the rates provided above for the prevalence of HLA-B*1502 may offer a rough guide, keeping in mind the limitations of these figures due to wide variability in rates even within ethnic groups, the difficulty in ascertaining ethnic ancestry, and the likelihood of mixed ancestry. Carbamazepine should not be used in patients positive for HLA-B*1502 unless the benefits clearly outweigh the risks. Tested patients who are found to be negative for the allele are thought to have a low risk of SJS/TEN (see BOXED WARNINGS and PRECAUTIONS, Laboratory Tests).Over 90% of carbamazepine treated patients who will experience SJS/TEN have this reaction within the first few months of treatment. This information may be taken into consideration in determining the need for screening of genetically at-risk patients currently on carbamazepine.The HLA-B*1502 allele has not been found to predict risk of less severe adverse cutaneous reactions from carbamazepine such as maculopapular eruption (MPE) or to predict Drug Reaction with Eosinophilia and Systemic Symptoms (DRESS). Limited evidence suggests that HLA-B*1502 may be a risk factor for the development of SJS/TEN in patients of Chinese ancestry taking other antiepileptic drugs associated with SJS/TEN, including phenytoin. Consideration should be given to avoiding use of other drugs associated with SJS/TEN in HLA-B*1502 positive patients, when alternative therapies are otherwise equally acceptable. Retrospective case-control studies in patients of European, Korean, and Japanese ancestry have found a moderate association between the risk of developing hypersensitivity reactions and the presence of HLA-A*3101, an inherited allelic variant of the HLA-A gene, in patients using carbamazepine. These hypersensitivity reactions include SJS/TEN, maculopapul ar eruptions, and Drug Reaction with Eosinophilia and Systemic Symptoms (see DRESS/Multiorgan hypersensitivitybelow).HLA-A*3101 is expected to be carried by more than 15% of patients of Japanese, Native American, Southern Indian (for example, Tamil Nadu) and some Arabic ancestry; up to about 10% in patients of Han Chinese, Korean, European, Latin American, and other Indian ancestry; and up to about 5% in African-Americans and patients of Thai, Taiwanese, and Chinese (Hong Kong) ancestry.The risks and benefits of carbamazepine therapy should be weighed before considering carbamazepine in patients known to be positive for HLA-A*3101.Application of HLA genotyping as a screening tool has important limitations and must never substitute for appropriate clinical vigilance and patient management. Many HLA-B*1502-positive and HLA-A*3101-positive patients treated with carbamazepine will not develop SJS/TEN or other hypersensitivity reactions, and these reactions can still occur infrequently in HLA-B*1502-negative and HLA-A*3101-negative patients of any ethnicity. The role of other possible factors in the development of, and morbidity from, SJS/TEN and other hypersensitivity reactions, such as antiepileptic drug (AED) dose, compliance, concomitant medications, comorbidities, and the level of dermatologic monitoring, have not been studied. Hypersensitivity reactions to carbamazepine have been reported in patients who previously experienced this reaction to anticonvulsants including phenytoin, primidone, and phenobarbital. If such history is present, benefits and risks should be carefully considered, and, if carbamazepine is initiated, the signs and symptoms of hypersensitivity should be carefully monitored.Patients should be informed that about a third of patients who have had hypersensitivity reactions to carbamazepine also experience hypersensitivity reactions with oxcarbazepine (Trileptal®*). Antiepileptic drugs (AEDs), including carbamazepine, increase the risk of suicidal thoughts or behavior in patients taking these drugs for any indication. Patients treated with any AED for any indication should be monitored for the emergence or worsening of depression, suicidal thoughts or behavior, and/or any unusual changes in mood or behavior.Pooled analyses of 199 placebo-controlled clinical trials (mono- and adjunctive therapy) of 11 different AEDs showed that patients randomized to one of the AEDs had approximately twice the risk (adjusted Relative Risk 1.8, 95% CI:1.2, 2.7) of suicidal thinking or behavior compared to patients randomized to placebo. In these trials, which had a median treatment duration of 12 weeks, the estimated incidence rate of suicidal behavior or ideation among 27,863 AED-treated patients was 0.43%, compared to 0.24% among 16,029 placebo-treated patients, representing an increase of approximately one case of suicidal thinking or behavior for every 530 patients treated. There were four suicides in drug-treated patients in the trials and none in placebo-treated patients, but the number is too small to allow any conclusion about drug effect on suicide.The increased risk of suicidal thoughts or behavior with AEDs was observed as early as one week after starting drug treatment with AEDs and persisted for the duration of treatment assessed. Because most trials included in the analysis did not extend beyond 24 weeks, the risk of suicidal thoughts or behavior beyond 24 weeks could not be assessed.The risk of suicidal thoughts or behavior was generally consistent among drugs in the data analyzed. The finding of increased risk with AEDs of varying mechanisms of action and across a range of indications suggests that the risk applies to all AEDs used for any indication. The risk did not vary substantially by age (5 to 100 years) in the clinical trials analyzed. Table 1 shows absolute and relative risk by indication for all evaluated AEDs.Table 1 Risk by Indication for Antiepileptic Drugs in the Pooled AnalysisIndication Placebo Patients with Events Per 1,000 Patients Drug Patients with Events Per 1,000 Patients Relative Risk: Incidence of Events in Drug Patients/ Incidence in Placebo Patients Risk Difference: Additional Drug Patients with Events Per 1,000 Patients Epilepsy 1.03.43.52.4Psychiatric 5.78.51.52.9Other 1.01.81.90.9Total 2.44.31.81.9The relative risk for suicidal thoughts or behavior was higher in clinical trials for epilepsy than in clinical trials for psychiatric or other conditions, but the absolute risk differences were similar for the epilepsy and psychiatric indications.Anyone considering prescribing carbamazepine or any other AED must balance the risk of suicidal thoughts or behavior with the risk of untreated illness. Epilepsy and many other illnesses for which AEDs are prescribed are themselves associated with morbidity and mortality and an increased risk of suicidal thoughts and behavior. Should suicidal thoughts and behavior emerge during treatment, the prescriber needs to consider whether the emergence of these symptoms in any given patient may be related to the illness being treated. Carbamazepine has shown mild anticholinergic activity that may be associated with increased intraocular pressure; therefore, patients with increased intraocular pressure should be closely observed during therapy. Because of the relationship of the drug to other tricyclic compounds, the possibility of activation of a latent psychosis and, in elderly patients, of confusion or agitation should be borne in mind. The use of carbamazepine should be avoided in patients with a history of hepatic porphyria (e.g., acute intermittent porphyria, variegate porphyria, porphyria cutanea tarda). Acute attacks have been reported in such patients receiving carbamazepine therapy. Carbamazepine administration has also been demonstrated to increase porphyrin precursors in rodents, a presumed mechanism for the induction of acute attacks of porphyria. As with all antiepileptic drugs, carbamazepine should be withdrawn gradually to minimize the potential of increased seizure frequency. Hyponatremia can occur as a result of treatment with carbamazepine. In many cases, the hyponatremia appears to be caused by the syndrome of inappropriate antidiuretic hormone secretion (SIADH). The risk of developing SIADH with carbamazepine treatment appears to be dose-related. Elderly patients and patients treated with diuretics are at greater risk of developing hyponatremia. Signs and symptoms of hyponatremia include headache, new or increased seizure frequency, difficulty concentrating, memory impairment, confusion, weakness, and unsteadiness, which can lead to falls. Consider discontinuing carbamazepine in patients with symptomatic hyponatremia. Before initiating therapy, a detailed history and physical examination should be made.Carbamazepine should be used with caution in patients with a mixed seizure disorder that includes atypical absence seizures, since in these patients carbamazepine has been associated with increased frequency of generalized convulsions (see INDICATIONS AND USAGE).Therapy should be prescribed only after critical benefit-to-risk appraisal in patients with a history of cardiac conduction disturbance, including second- and third-degree AV heart block; cardiac, hepatic, or renal damage; adverse hematologic or hypersensitivity reaction to other drugs, including reactions to other anticonvulsants; or interrupted courses of therapy with carbamazepine.AV heart block, including second- and third-degree block, have been reported following carbamazepine treatment. This occurred generally, but not solely, in patients with underlying EKG abnormalities or risk factors for conduction disturbances.Hepatic effects, ranging from slight elevations in liver enzymes to rare cases of hepatic failure have been reported (see ADVERSE REACTIONS and PRECAUTIONS, Laboratory Tests). In some cases, hepatic effects may progress despite discontinuation of the drug. In addition rare instances of vanishing bile duct syndrome have been reported. This syndrome consists of a cholestatic process with a variable clinical course ranging from fulminant to indolent, involving the destruction and disappearance of the intrahepatic bile ducts. Some, but not all, cases are associated with features that overlap with other immunoallergenic syndromes such as multiorgan hypersensitivity (DRESS syndrome) and serious dermatologic reactions. As an example there has been a report of vanishing bile duct syndrome associated with Stevens-Johnson syndrome and in another case an association with fever and eosinophilia.Since a given dose of carbamazepine suspension will produce higher peak levels than the same dose given as the tablet, it is recommended that patients given the suspension be started on lower doses and increased slowly to avoid unwanted side effects (see DOSAGE AND ADMINISTRATION).Carbamazepine suspension contains sorbitol and, therefore, should not be administered to patients with rare hereditary problems of fructose intolerance. Carbamazepine can cause fetal harm when administered to a pregnant woman. Epidemiological data suggest that there may be an association between the use of carbamazepine during pregnancy and congenital malformations, including spina bifida. There have also been reports that associate carbamazepine with developmental disorders and congenital anomalies (e.g., craniofacial defects, cardiovascular malformations, and anomalies involving various body systems). Developmental delays based on neurobehavioral assessments have been reported. When treating or counseling women of childbearing potential, the prescribing physician will wish to weigh the benefits of therapy against the risks. If this drug is used during pregnancy, or if the patient becomes pregnant while taking this drug, the patient should be apprised of the potential hazard to the fetus. Retrospective case reviews suggest that, compared with monotherapy, there may be a higher prevalence of teratogenic effects associated with the use of anticonvulsants in combination therapy. Therefore, if therapy is to be continued, monotherapy may be preferable for pregnant women. In humans, transplacental passage of carbamazepine is rapid (30 to 60 minutes), and the drug is accumulated in the fetal tissues, with higher levels found in liver and kidney than in brain and lung. Carbamazepine has been shown to have adverse effects in reproduction studies in rats when given orally in dosages 10 to 25 times the maximum human daily dosage (MHDD) of 1200 mg on a mg/kg basis or 1.5 to 4 times the MHDD on a mg/m2basis. In rat teratology studies, 2 of 135 offspring showed kinked ribs at 250 mg/kg and 4 of 119 offspring at 650 mg/kg showed other anomalies (cleft palate, 1; talipes, 1; anophthalmos, 2). In reproduction studies in rats, nursing offspring demonstrated a lack of weight gain and an unkempt appearance at a maternal dosage level of 200 mg/kg. Antiepileptic drugs should not be discontinued abruptly in patients in whom the drug is administered to prevent major seizures because of the strong possibility of precipitating status epilepticus with attendant hypoxia and threat to life. In individual cases where the severity and frequency of the seizure disorder are such that removal of medication does not pose a serious threat to the patient, discontinuation of the drug may be considered prior to and during pregnancy, although it cannot be said with any confidence that even minor seizures do not pose some hazard to the developing embryo or fetus. Tests to detect defects using currently accepted procedures should be considered a part of routine prenatal care in childbearing women receiving carbamazepine. There have been a few cases of neonatal seizures and/or respiratory depression associated with maternal carbamazepine and other concomitant anticonvulsant drug use. A few cases of neonatal vomiting, diarrhea, and/or decreased feeding have also been reported in association with maternal carbamazepine use. These symptoms may represent a neonatal withdrawal syndrome. To provide information regarding the effects of in utero exposure to carbamazepine, physicians are advised to recommend that pregnant patients taking carbamazepine enroll in the North American Antiepileptic Drug (NAAED) Pregnancy Registry. This can be done by calling the toll free number 1-888-233-2334, and must be done by patients themselves. Information on the registry can also be found at the website http://www.aedpregnancyregistry.org/. Patients should be informed of the availability of a Medication Guide and they should be instructed to read the Medication Guide before taking carbamazepine.Patients should be made aware of the early toxic signs and symptoms of a potential hematologic problem, as well as dermatologic, hypersensitivity or hepatic reactions. These symptoms may include, but are not limited to, fever, sore throat, rash, ulcers in the mouth, easy bruising, lymphadenopathy and petechial or purpuric hemorrhage, and in the case of liver reactions, anorexia, nausea/vomiting, or jaundice. The patient should be advised that, because these signs and symptoms may signal a serious reaction, that they must report any occurrence immediately to a physician. In addition, the patient should be advised that these signs and symptoms should be reported even if mild or when occurring after extended use.Patients should be advised that serious skin reactions have been reported in association with carbamazepine. In the event a skin reaction should occur while taking carbamazepine, patients should consult with their physician immediately (see WARNINGS).Patients should be advised that anaphylactic reactions and angioedema may occur during treatment with carbamazepine (see WARNINGS). Advise patients to immediately report signs and symptoms suggesting angioedema (swelling of the face, eyes, lips, or tongue, or difficulty in swallowing or breathing) and to stop taking the drug until they have consulted with their healthcare provider.Patients, their caregivers, and families should be counseled that AEDs, including carbamazepine, may increase the risk of suicidal thoughts and behavior and should be advised of the need to be alert for the emergence or worsening of symptoms of depression, any unusual changes in mood or behavior, or the emergence of suicidal thoughts, behavior, or thoughts about self-harm. Behaviors of concern should be reported immediately to healthcare providers.Carbamazepine may interact with some drugs. Therefore, patients should be advised to report to their doctors the use of any other prescription or nonprescription medications or herbal products.Caution should be exercised if alcohol is taken in combination with carbamazepine therapy, due to a possible additive sedative effect.Since dizziness and drowsiness may occur, patients should be cautioned about the hazards of operating machinery or automobiles or engaging in other potentially dangerous tasks.Patients should be encouraged to enroll in the NAAED Pregnancy Registry if they become pregnant. This registry is collecting information about the safety of antiepileptic drugs during pregnancy. To enroll, patients can call the toll free number 1-888-233-2334 (see WARNINGS, Usage in Pregnancy subsection). For genetically at-risk patients (see WARNINGS), high-resolution 'HLA-B*1502 typing' is recommended. The test is positive if either one or two HLA-B*1502 alleles are detected and negative if no HLA-B*1502 alleles are detected.Complete pretreatment blood counts, including platelets and possibly reticulocytes and serum iron, should be obtained as a baseline. If a patient in the course of treatment exhibits low or decreased white blood cell or platelet counts, the patient should be monitored closely. Discontinuation of the drug should be considered if any evidence of significant bone marrow depression develops. Baseline and periodic evaluations of liver function, particularly in patients with a history of liver disease, must be performed during treatment with this drug since liver damage may occur (see PRECAUTIONS, General and ADVERSE REACTIONS). Carbamazepine should be discontinued, based on clinical judgment, if indicated by newly occurring or worsening clinical or laboratory evidence of liver dysfunction or hepatic damage, or in the case of active liver disease.Baseline and periodic eye examinations, including slit-lamp, funduscopy, and tonometry, are recommended since many phenothiazines and related drugs have been shown to cause eye changes.Baseline and periodic complete urinalysis and BUN determinations are recommended for patients treated with this agent because of observed renal dysfunction.Monitoring of blood levels (see CLINICAL PHARMACOLOGY) has increased the efficacy and safety of anticonvulsants. This monitoring may be particularly useful in cases of dramatic increase in seizure frequency and for verification of compliance. In addition, measurement of drug serum levels may aid in determining the cause of toxicity when more than one medication is being used.Thyroid function tests have been reported to show decreased values with carbamazepine administered alone.Interference with some pregnancy tests has been reported. When carbamazepine is given with drugs that can increase or decrease carbamazepine levels, close monitoring of carbamazepine levels is indicated and dosage adjustment may be required.Agents That Increase Carbamazepine LevelsCYP3A4 inhibitors inhibit carbamazepine metabolism and can thus increase plasma carbamazepine levels. Drugs that have been shown, or would be expected, to increase plasma carbamazepine levels include aprepitant, cimetidine, ciprofloxacin, danazol, diltiazem, macrolides, erythromycin, troleandomycin, clarithromycin, fluoxetine, fluvoxamine, trazodone, olanzapine, loratadine, terfenadine, omeprazole, oxybutynin, dantrolene, isoniazid, niacinamide, nicotinamide, ibuprofen, propoxyphene, azoles (e.g., ketaconazole, itraconazole, fluconazole, voriconazole), acetazolamide, verapamil, ticlopidine, grapefruit juice, and protease inhibitors.Human microsomal epoxide hydrolase has been identified as the enzyme responsible for the formation of the 10,11-transdiol derivative from carbamazepine-10,11 epoxide. Coadministration of inhibitors of human microsomal epoxide hydrolase may result in increased carbamazepine-10,11 epoxide plasma concentrations. Accordingly, the dosage of carbamazepine should be adjusted and/or the plasma levels monitored when used concomitantly with loxapine, quetiapine, or valproic acid.Agents That Decrease Carbamazepine LevelsCYP3A4 inducers can increase the rate of carbamazepine metabolism. Drugs that have been shown, or that would be expected, to decrease plasma carbamazepine levels includecisplatin, doxorubicin hydrochloride, felbamate, fosphenytoin, rifampin, phenobarbital, phenytoin, primidone, methsuximide, theophylline, aminophylline. Decreased Levels of Concomitant MedicationsCarbamazepine is a potent inducer of hepatic 3A4 and is also known to be an inducer of CYP1A2, 2B6, 2C9/19 and may therefore reduce plasma concentrations of co-medications mainly metabolized by CYP 1A2, 2B6, 2C9/19 and 3A4, through induction of their metabolism. When used concomitantly with carbamazepine, monitoring of concentrations or dosage adjustment of these agents may be necessary: When carbamazepine is added to aripiprazole, the aripiprazole dose should be doubled. Additional dose increases should be based on clinical evaluation. If carbamazepine is later withdrawn, the aripiprazole dose should be reduced.When carbamazepine is used with tacrolimus, monitoring of tacrolimus blood concentrations and appropriate dosage adjustments are recommended.The use of concomitant strong CYP3A4 inducers such as carbamazepine should be avoided with temsirolimus. If patients must be coadministered carbamazepine with temsirolimus, an adjustment of temsirolimus dosage should be considered.The use of carbamazepine with lapatinib should generally be avoided. If carbamazepine is started in a patient already taking lapatinib, the dose of lapatinib should be gradually titrated up. If carbamazepine is discontinued, the lapatinib dose should be reduced.Concomitant use of carbamazepine with nefazodone results in plasma concentrations of nefazodone and its active metabolite insufficient to achieve a therapeutic effect. Coadministration of carbamazepine with nefazodone is contraindicated (see CONTRAINDICATIONS).Monitor concentrations of valproate when carbamazepine is introduced or withdrawn in patients using valproic acid.In addition, carbamazepine causes, or would be expected to cause, decreased levels of the following drugs, for which monitoring of concentrations or dosage adjustment may be necessary: acetaminophen, albendazole, alprazolam, aprepitant, buprenorphone, bupropion, citalopram, clonazepam, clozapine, corticosteroids (e.g., prednisolone, dexamethasone), cyclosporine, dicumarol, dihydropyridine calcium channel blockers (e.g., felodipine), doxycycline, eslicarbazepine, ethosuximide, everolimus, haloperidol, imatinib, itraconazole, lamotrigine, levothyroxine, methadone, methsuximide, mianserin, midazolam, olanzapine, oral and other hormonal contraceptives, oxcarbazepine, paliperidone, phensuximide, phenytoin, praziquantel, protease inhibitors, risperidone, sertraline, sirolimus, tadalafil, theophylline, tiagabine, topiramate, tramadol, trazodone, tricyclic antidepressants (e.g., imipramine, amitriptyline, nortriptyline), valproate, warfarin, ziprasidone, zonisamide. Cyclophosphamide is an inactive prodrug and is converted to its active metabolite in part by CYP3A. The rate of metabolism and the leukopenic activity of cyclophosphamide are reportedly increased by chronic coadministration of CYP3A4 inducers. There is a potential for increased cyclophosphamide toxicity when coadministered with carbamazepine.Concomitant administration of carbamazepine and lithium may increase the risk of neurotoxic side effects.Concomitant use of carbamazepine and isoniazid has been reported to increase isoniazid-induced hepatotoxicity.Alterations of thyroid function have been reported in combination therapy with other anticonvulsant medications.Concomitant use of carbamazepine with hormonal contraceptive products (e.g., oral, and levonorgestrel subdermal implant contraceptives) may render the contraceptives less effective because the plasma concentrations of the hormones may be decreased. Breakthrough bleeding and unintended pregnancies have been reported. Alternative or back-up methods of contraception should be considered.Resistance to the neuromuscular blocking action of the nondepolarizing neuromuscular blocking agents pancuronium, vecuronium, rocuronium and cisatracurium has occurred in patients chronically administered carbamazepine. Whether or not carbamazepine has the same effect on other non-depolarizing agents is unknown. Patients should be monitored closely for more rapid recovery from neuromuscular blockade than expected, and infusion rate requirements may be higher.Concomitant use of carbamazepine with rivaroxaban, apixaban, dabigatran, and edoxaban (direct acting oral anticoagulants) is expected to result in decreased plasma concentrations of these anticoagulants that may be insufficient to achieve the intended therapeutic effect. In general, coadministration of carbamazepine with rivaroxaban, apixaban, dabigatran, and edoxaban should be avoided. Carbamazepine, when administered to Sprague-Dawley rats for two years in the diet at doses of 25 mg/kg/day, 75 mg/kg/day, and 250 mg/kg/day, resulted in a dose-related increase in the incidence of hepatocellular tumors in females and of benign interstitial cell adenomas in the testes of males.Carbamazepine must, therefore, be considered to be carcinogenic in Sprague-Dawley rats. Bacterial and mammalian mutagenicity studies using carbamazepine produced negative results. The significance of these findings relative to the use of carbamazepine in humans is, at present, unknown. Carbamazepine and its epoxide metabolite are transferred to breast milk. The ratio of the concentration in breast milk to that in maternal plasma is about 0.4 for carbamazepine and about 0.5 for the epoxide. The estimated doses given to the newborn during breastfeeding are in the range of 2 mg to 5 mg daily for carbamazepine and 1 mg to 2 mg daily for the epoxide.Because of the potential for serious adverse reactions in nursing infants from carbamazepine, a decision should be made whether to discontinue nursing or to discontinue the drug, taking into account the importance of the drug to the mother. Substantial evidence of carbamazepine's effectiveness for use in the management of children with epilepsy (see INDICATIONS AND USAGE for specific seizure types) is derived from clinical investigations performed in adults and from studies in several in vitro systems which support the conclusion that (1) the pathogenetic mechanisms underlying seizure propagation are essentially identical in adults and children, and (2) the mechanism of action of carbamazepine in treating seizures is essentially identical in adults and children.Taken as a whole, this information supports a conclusion that the generally accepted therapeutic range of total carbamazepine in plasma (i.e. 4 mcg/mL to 12 mcg/mL) is the same in children and adults.The evidence assembled was primarily obtained from short-term use of carbamazepine. The safety of carbamazepine in children has been systematically studied up to 6 months. No longer-term data from clinical trials is available. If adverse reactions are of such severity that the drug must be discontinued, the physician must be aware that abrupt discontinuation of any anticonvulsant drug in a responsive epileptic patient may lead to seizures or even status epilepticus with its life-threatening hazards.The most severe adverse reactions have been observed in the hemopoietic system and skin (see BOXED WARNING), the liver, and the cardiovascular system.The most frequently observed adverse reactions, particularly during the initial phases of therapy, are dizziness, drowsiness, unsteadiness, nausea, and vomiting. To minimize the possibility of such reactions, therapy should be initiated at the lowest dosage recommended.The following additional adverse reactions have been reported:Hemopoietic System: Aplastic anemia, agranulocytosis, pancytopenia, bone marrow depression, thrombocytopenia, leukopenia, leukocytosis, eosinophilia, acute intermittent porphyria, variegate porphyria, porphyria cutanea tarda.Skin: Toxic epidermal necrolysis (TEN) and Stevens-Johnson syndrome (SJS) (see BOXED WARNING), Acute Generalized Exanthematous Pustulosis (AGEP), pruritic and erythematous rashes, urticaria, photosensitivity reactions, alterations in skin pigmentation, exfoliative dermatitis, erythema multiforme and nodosum, purpura, aggravation of disseminated lupus erythematosus, alopecia, diaphoresis, onychomadesis and hirsutism. In certain cases, discontinuation of therapy may be necessary. Cardiovascular System: Congestive heart failure, edema, aggravation of hypertension, hypotension, syncope and collapse, aggravation of coronary artery disease, arrhythmias and AV block, thrombophlebitis, thromboembolism (e.g., pulmonary embolism), and adenopathy or lymphadenopathy.Some of these cardiovascular complications have resulted in fatalities. Myocardial infarction has been associated with other tricyclic compounds.Liver: Abnormalities in liver function tests, cholestatic and hepatocellular jaundice, hepatitis, very rare cases of hepatic failure.Pancreatic: Pancreatitis.Respiratory System: Pulmonary hypersensitivity characterized by fever, dyspnea, pneumonitis, or pneumonia.Genitourinary System: Urinary frequency, acute urinary retention, oliguria with elevated blood pressure, azotemia, renal failure, and impotence. Albuminuria, glycosuria, elevated BUN, and microscopic deposits in the urine have also been reported. There have been rare reports of impaired male fertility and/or abnormal spermatogenesis.Testicular atrophy occurred in rats receiving carbamazepine orally from 4 to 52 weeks at dosage levels of 50 mg/kg/day to 400 mg/kg/day. Additionally, rats receiving carbamazepine in the diet for 2 years at dosage levels of 25 mg/kg/day, 75 mg/kg/day, and 250 mg/kg/day had a dose-related incidence of testicular atrophy and aspermatogenesis. In dogs, it produced a brownish discoloration, presumably a metabolite, in the urinary bladder at dosage levels of 50 mg/kg and higher. Relevance of these findings to humans is unknown. Nervous System: Dizziness, drowsiness, disturbances of coordination, confusion, headache, fatigue, blurred vision, visual hallucinations, transient diplopia, oculomotor disturbances, nystagmus, speech disturbances, abnormal involuntary movements, peripheral neuritis and paresthesias, depression with agitation, talkativeness, tinnitus, hyperacusis, neuroleptic malignant syndrome. There have been reports of associated paralysis and other symptoms of cerebral arterial insufficiency, but the exact relationship of these reactions to the drug has not been established. Isolated cases of neuroleptic malignant syndrome have been reported both with and without concomitant use of psychotropic drugs. Digestive System: Nausea, vomiting, gastric distress and abdominal pain, diarrhea, constipation, anorexia, and dryness of the mouth and pharynx, including glossitis and stomatitis. Eyes: Scattered punctate cortical lens opacities, increased intraocular pressure (see WARNINGS, General) as well as conjunctivitis, have been reported. Although a direct causal relationship has not been established, many phenothiazines and related drugs have been shown to cause eye changes. Musculoskeletal System: Aching joints and muscles, and leg cramps. Metabolism: Fever and chills. Hyponatremia (seeWARNINGS,General). Decreased levels of plasma calcium have been reported. Osteoporosis has been reported.Isolated cases of a lupus erythematosus-like syndrome have been reported. There have been occasional reports of elevated levels of cholesterol, HDL cholesterol, and triglycerides in patients taking anticonvulsants. A case of aseptic meningitis, accompanied by myoclonus and peripheral eosinophilia, has been reported in a patient taking carbamazepine in combination with other medications. The patient was successfully dechallenged, and the meningitis reappeared upon rechallenge with carbamazepine. Lowest known lethal dose: adults, 3.2 g (a 24-year-old woman died of a cardiac arrest and a 24-year-old man died of pneumonia and hypoxic encephalopathy); children, 4 g (a 14-year-old girl died of a cardiac arrest), 1.6 g (a 3-year-old girl died of aspiration pneumonia).Oral LD50 in animals (mg/kg): mice, 1,100 to 3,750; rats, 3,850 to 4,025; rabbits, 1,500 to 2,680; guinea pigs, 920. The first signs and symptoms appear after 1 to 3 hours. Neuromuscular disturbances are the most prominent. Cardiovascular disorders are generally milder, and severe cardiac complications occur only when very high doses (greater than 60 g) have been ingested.Respiration: Irregular breathing, respiratory depression.Cardiovascular System: Tachycardia, hypotension or hypertension, shock, conduction disorders.Nervous System and Muscles: Impairment of consciousness ranging in severity to deep coma. Convulsions, especially in small children. Motor restlessness, muscular twitching, tremor, athetoid movements, opisthotonos, ataxia, drowsiness, dizziness, mydriasis, nystagmus, adiadochokinesia, ballism, psychomotor disturbances, dysmetria. Initial hyperreflexia, followed by hyporeflexia.Gastrointestinal Tract: Nausea, vomiting.Kidneys and Bladder: Anuria or oliguria, urinary retention.Laboratory Findings: Isolated instances of overdosage have included leukocytosis, reduced leukocyte count, glycosuria, and acetonuria. EEG may show dysrhythmias.Combined Poisoning: When alcohol, tricyclic antidepressants, barbiturates, or hydantoins are taken at the same time, the signs and symptoms of acute poisoning with carbamazepine may be aggravated or modified.Treatment The prognosis in cases of severe poisoning is critically dependent upon prompt elimination of the drug, which may be achieved by inducing vomiting, irrigating the stomach, and by taking appropriate steps to diminish absorption. If these measures cannot be implemented without risk on the spot, the patient should be transferred at once to a hospital, while ensuring that vital functions are safeguarded. There is no specific antidote.Elimination of the Drug: Induction of vomiting.Gastric lavage. Even when more than 4 hours have elapsed following ingestion of the drug, the stomach should be repeatedly irrigated, especially if the patient has also consumed alcohol.Measures to Reduce Absorption: Activated charcoal, laxatives.Measures to Accelerate Elimination: Forced diuresis.Dialysis is indicated only in severe poisoning associated with renal failure. Replacement transfusion is indicated in severe poisoning in small children.Respiratory Depression: Keep the airways free; resort, if necessary, to endotracheal intubation, artificial respiration, and administration of oxygen.Hypotension, Shock: Keep the patient's legs raised and administer a plasma expander. If blood pressure fails to rise despite measures taken to increase plasma volume, use of vasoactive substances should be considered.Convulsions: Diazepam or barbiturates.Warning: Diazepam or barbiturates may aggravate respiratory depression (especially in children), hypotension, and coma. However, barbiturates should not be used if drugs that inhibit monoamine oxidase have also been taken by the patient either in overdosage or in recent therapy (within 1 week).Surveillance: Respiration, cardiac function (ECG monitoring), blood pressure, body temperature, pupillary reflexes, and kidney and bladder function should be monitored for several days.Treatment of Blood Count Abnormalities: If evidence of significant bone marrow depression develops, the following recommendations are suggested: (1) stop the drug, (2) perform daily CBC, platelet, and reticulocyte counts, (3) do a bone marrow aspiration and trephine biopsy immediately and repeat with sufficient frequency to monitor recovery.Special periodic studies might be helpful as follows: (1) white cell and platelet antibodies, (2) 59Fe-ferrokinetic studies, (3) peripheral blood cell typing, (4) cytogenetic studies on marrow and peripheral blood, (5) bone marrow culture studies for colony-forming units, (6) hemoglobin electrophoresis for A2 and F hemoglobin, and (7) serum folic acid and B12 levels. A fully developed aplastic anemia will require appropriate, intensive monitoring and therapy, for which specialized consultation should be sought.